"They walked my wife through every step of what could have been a difficult process. They made it easy. 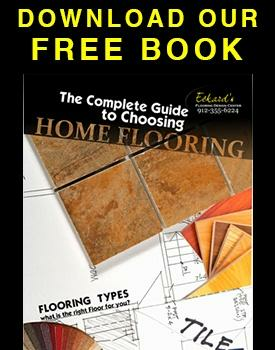 I would recommend them for anyone's flooring needs." Are You Considering Vinyl Flooring? Here is A Simple Buying Guide. Are you looking for fuss-free flooring for your home? Do you need a practical, simple and budget-friendly flooring choice? Vinyl flooring is your ideal option. Kitchens and bathrooms require smooth flooring that is able to withstand constant and intense moisture content on the floor surface. Vinyl is a flexible flooring choice that can seamlessly fit your design scheme. Be it the luxury vinyl flooring or luxury vinyl plank flooring, any choice can comfortably suit all your basic needs. Below are some of the styles of vinyl flooring that we offer at our stores. This type of wood flooring is specifically designed to appear as identical as possible to natural hardwood flooring. The maintenance requirement is minimal. Its textured surface is designed to imitate the wood grains. The shades range from rich oak to plank vinyl flooring. The planks often look like real wood and visitors might never realize that the flooring is not actually real wood. This type of vinyl flooring imitates the real floor tiles for attractiveness and practicality. The luxury vinyl flooring designs range from the delicate looking ones to replicas of real marbles or granite with colors matching your tastes and preferences. Real mosaic tile flooring is harder to lay on the floor surface. It is also expensive. You do not have to rob a bank to get the look you want – consider the vinyl flooring that mimics the real thing. The mimics are easier to install than the real mosaic and they come in a range of colors and styles featuring both modern and traditional designs. You can get almost any modern design style you need from the vinyl flooring. From muted colors to bright yellow designs, you are assured of finding the best vinyl flooring to fit with your interior décor. In fact, traditional homes can update their look by being fitted with the modern flooring to enhance their aesthetic beauty and appearance. Vinyl is a plastic material that consists of ethylene and chlorine. It is a man-made and synthetic material. You can clean them easily without the need to uninstall them from the floor, unlike carpets. Its maintenance and repair are the easiest among the flooring materials. Vinyl flooring is the cheapest and most durable and it can resist scratch and water penetration. What more do you need? So What Exactly are the Luxury Vinyl Flooring Tiles? On the high-end side of the range of vinyl products, luxury vinyl flooring tiles look authentic even though they are not actually marble, hardwood or stone. You can get all the benefits offered by traditional flooring, including the wood planks, at a lower cost. Vinyl flooring is known for its resistance to stubborn stains, moisture and scratches. This makes it an ideal option for installation in high traffic areas, including kitchens and bathrooms where water spills are common. It is also easier to repair. You do not need to hire a professional to execute the necessary repairs – you can do it yourself. The modern designs of vinyl flooring are comfortable and soft to the feet. Consider an extra thick vinyl for extra comfort and warmth.